Since the invention of the metal piston ring at the start of the industrial revolution (which, you could argue, finally made steam power impractical), there’s been constant innovation and improvement in cylinder sealing technology for these seemingly simple parts. The ring package has three primary goals: Keep pressure confined to the combustion chamber on both the compression and power strokes, transfer heat from the piston to the cylinder walls where it can be removed via air or liquid cooling, and control lubrication to limit oil consumption and unwanted emissions. A conventional automotive ringback must work in harmony to seal combustion pressure, control oil, and transfer heat into the engine block. While it’s easy to look at the top ring or the oil ring at the bottom and intuitively understand their contribution to meeting these objectives, the second ring is more of a mystery. What’s it supposed to be doing, and why is it necessary? How do the materials used and physical properties of the second ring affect performance? To answer these questions, we turned to Senior Technical Account Manager Alan Stevenson, the go-to source for knowledge about piston rings. Note the subtle hook shape at the edge of the ring. This is a Napier-style 2nd ring and that "hook" helps it pull oil off the cylinder wall as the piston slides down the cylinder bore. 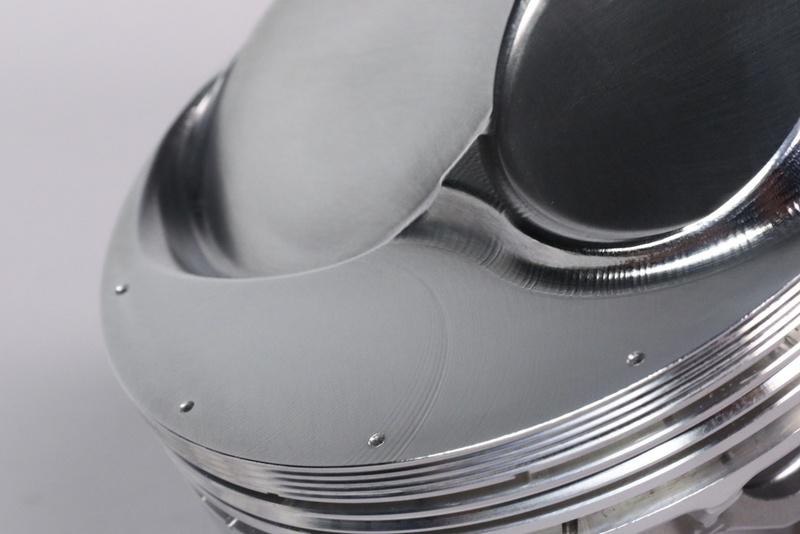 So what’s the contribution of a modern second ring to combustion chamber sealing? Per Stevenson, “Negligible. There have been SAE papers published that prove how enlarged second ring gaps actually increase top ring sealing and power. 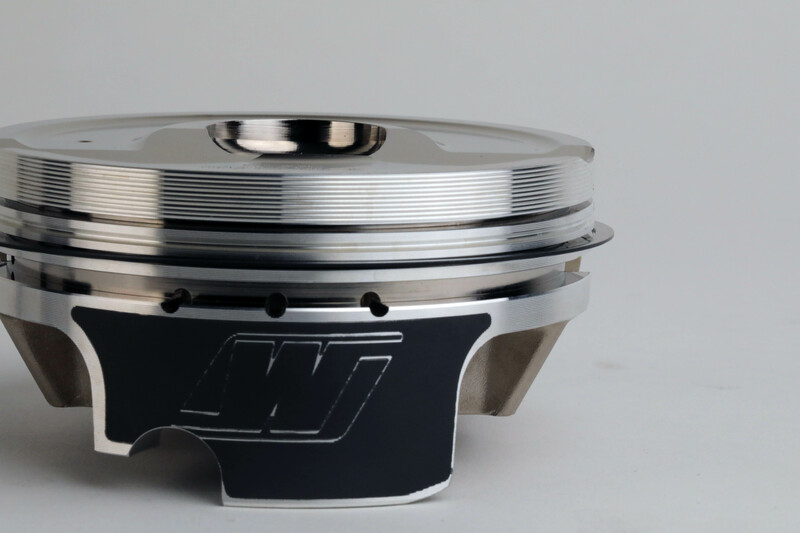 Combustion sealing is 100 percent the top ring’s job.” Combined with other piston features, the second ring’s role in this respect is to keep the pressure in the crevice space between it and the top ring as low as possible, giving any blow-by that makes it past the top compression ring a way to quickly escape to the crankcase. While the oil rings do the brunt of the work "pumping" oil away from the cylinder wall face, the second ring plays a vital roll scraping it off the face of the cylinder. 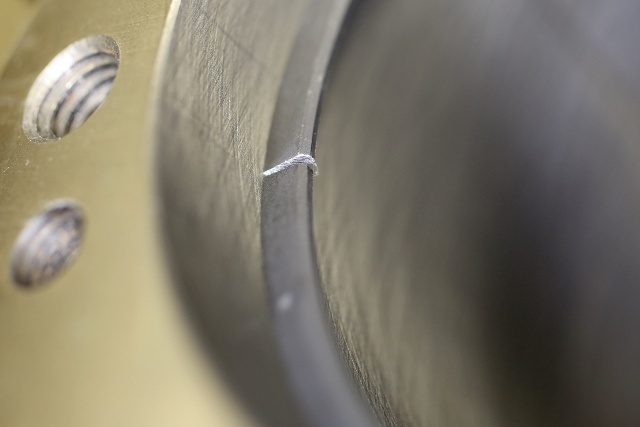 As rings continue to shrink in dimension to reduce friction, material and manufacturing becomes far more critical. 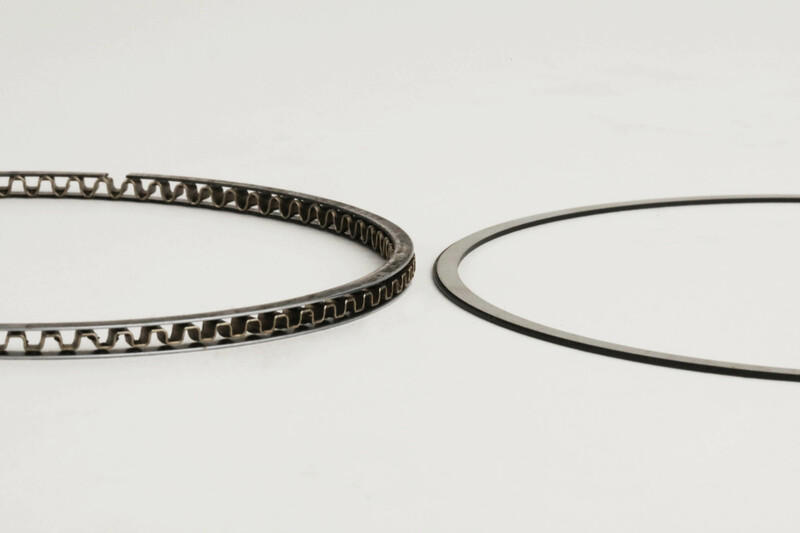 Carbon steel is the material of choice for most performance applications, especially late-model–and offers robustness and durability far exceeding earlier, thicker rings. The remaining 30 percent escapes via other routes, like radiation and convection cooling of the underside of the piston to the air inside the crankcase, conduction cooling through contact between the piston skirt and the cylinder bore, and heat carried away via oil splash from crankshaft windage. Some engines even employ oil squirters at the bottom of each cylinder bore that direct a spray of lubricant at the underside of the pistons specifically to aid in cooling. 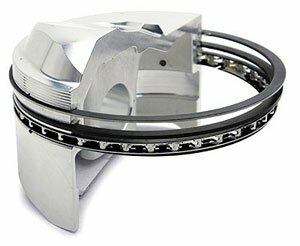 Thinner piston rings are far more likely to be damaged during installation than older-thicker rings. Using a tapered ring compressor should be considered an absolutely necessity when building a late-model engine. Other sources of heat transfer notwithstanding, the ring package handles most of the load when it comes to keeping the piston at an acceptable operating temperature. Out of that previously mentioned 70 percent of total piston heat, “The top ring transfers 45 percent, the second ring 20 percent, and the oil ring 5 percent,” says Stevenson. While the second ring definitely plays its part in this critical task, it’s still not the ring’s primary reason for being there. As it turns out, the second ring has a lot more to do with lubrication control than the “oil ring” beneath it. “The second ring is what scrapes the oil,” Stevenson explains. “The oil ring is what gathers it and pumps it away from the cylinder walls via oil return holes in the oil ring groove.” The second ring’s main function is to continuously remove excess oil from the bore - as the crank rotates, oil escaping from the pressurized bearings on the rod big ends is constantly thrown up behind the piston, coating the walls of the bore. As the piston moves down the bore, the second ring "scrapes the oil from the cylinder wall, both providing lubrication and keeping oil from entering the combustion area of the engine. On the downstroke, the second ring and the oil ring work in concert to clear all but a tiny amount of oil and return it down the bore to the sump. Stevenson says, “The top rings will always receive latent lubrication by oil trapped in the cross-hatch of the cylinder walls.” It’s that microscopic texture on the bore that retains just enough oil to keep friction between the ring package and the cylinder wall to a minimum, while the second ring prevents too much oil from making it up past the top ring and into the combustion chamber. Move down a groove on the piston, and the different job being performed places lower demands on the material being used. Per Stevenson, “Many second rings in racing engines are still cast iron or ductile iron. 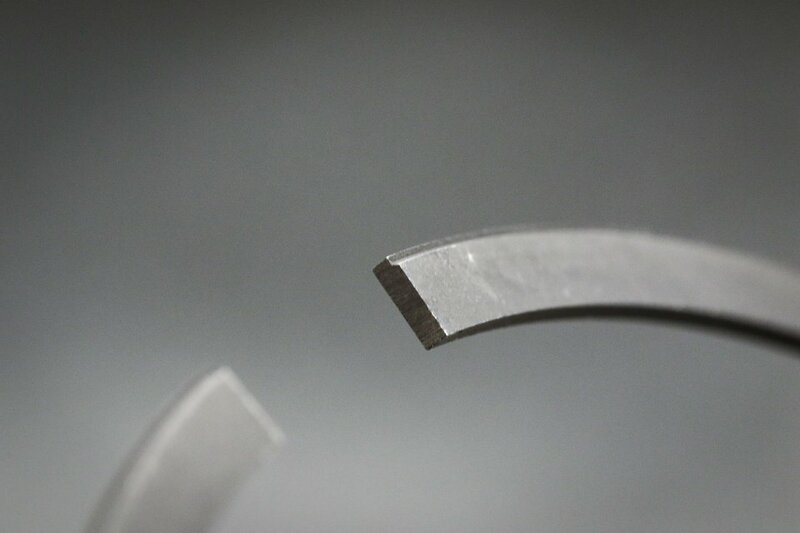 The second ring is not under enough stress and temperature to necessitate steel.” The shape of the ring profile also has a significant effect on how efficiently it removes oil, as well as how much friction it introduces, and both the interior and exterior diameters have a role to play. “Bevels are on the inside diameter of the ring and dictate the direction the ring twists to aid in scraping,” Stevenson says. Viewed in cross section, a beveled ring has one edge of the inside diameter cut at an angle - as Stevenson points out, this encourages the ring to dynamically twist in the groove as it moves down the bore and focus additional pressure on the outside corner, in order to more efficiently sweep excess oil away. Gas ports are another way piston designers can manipulate how rings work. By allowing combustion pressure to access the backside of the top ring, they increase ring seal increasing power, while reducing friction on the other three strokes. “Taper, Napier and steps are all variations of the outside diameter shape,” he continues. The goal with all these profiles is to concentrate contact into a narrow band to increase the efficiency of the scraping action. As the name implies, a tapered outer profile is narrower at the top than at the bottom, while a stepped ring profile has what looks like a notch in the cross section, oriented toward the direction of travel on the downstroke. A Napier ring, named for the famed British D. Napier & Son engineering firm that originally developed the profile, is actually undercut at an angle or even hook-shaped on the outside diameter, further decreasing the contact area and providing space for scavenged oil to escape, away from the cylinder bore. “In order, the most efficient scraper is Napier, followed by step, followed by taper. Run a Napier if it’s available in your bore size and suits the groove in the pistons,” Stevenson concludes. What kind of a combination you are running will also influence the optimum choice for your ring package, including the second ring. 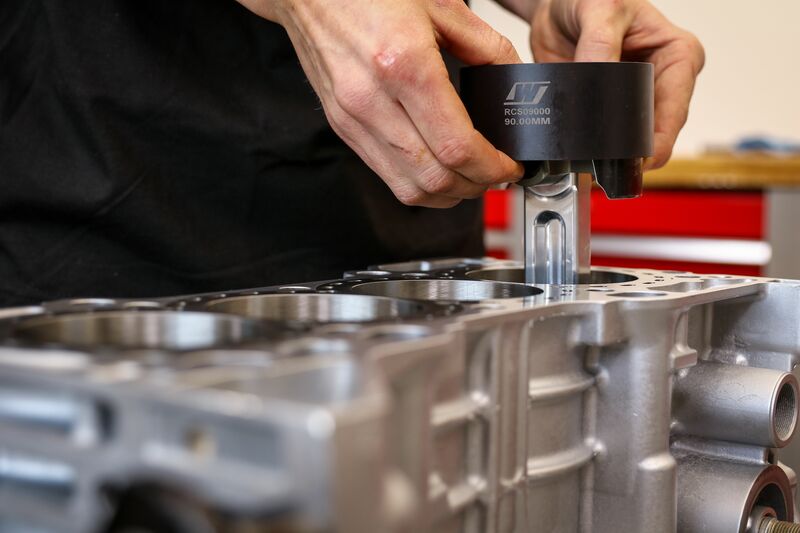 Stevenson advises, “Thinner second rings are more prevalent in dry sump engines pulling gobs of pan vacuum.” Because crankcase vacuum helps ring seal across the board, it’s possible to get the desired results without working the second ring quite as hard. “Naturally aspirated with no vacuum help should usually be 1.5mm or larger, while forced induction should err towards larger 1/16-inch rings,” he adds. Setting the proper ring gap is paramount to achieving the desired engine operating characteristics. 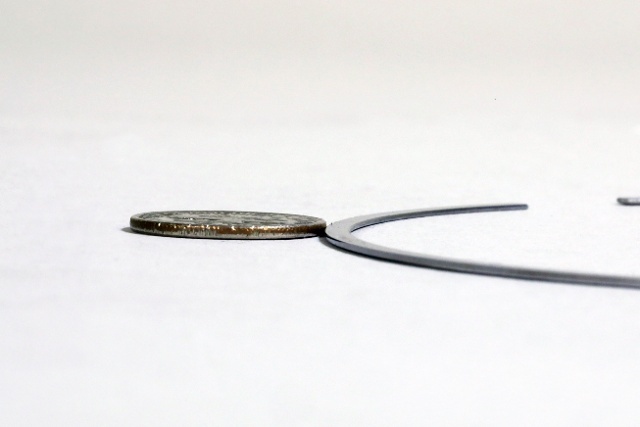 In any performance application, the 2nd ring gap should be larger than that of the top ring to allow blow-by to escape and prevent ring flutter from upsetting the top ring's seal. As you can see, second ring design and engineering is a complex subject, but fortunately the experts at Wiseco have the collective experience in all forms of high-performance engine builds to provide you with sound advice for your particular needs. While we can’t cover everything in a single tech article, we hope that what you’ve learned here will help you to better understand the ‘why’ behind a ring package’s specifications and take full advantage of the knowledge on tap from Wiseco’s staff when putting together your own combination.